Ready to have your assignee mobile app for free? Mobile has forever changed relocation industry. In a world where relocation means mobility, offering your customers a relocation mobile app is increasingly important. 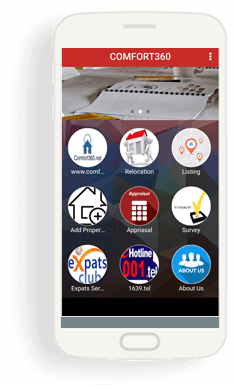 Egypt Relocation Services apps- COMFORT360- simplify the relocation experience by keeping everything organized, this way technology can transform the relocation experience and make it more enjoyable. 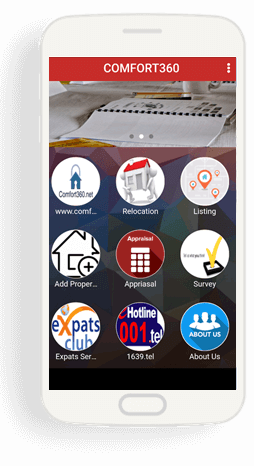 Egypt Relocation Services apps make all previous experience in your hand, it has changed all of them: from organizing tours, services to finding the best places at your destinations. Now you don't have to worry anymore about your destination & orientation tours inside Egypt using our app! You can fill your questionnaire online in easy simple way. Sign up for a free account, add your assignee in our database Itinerary Management platform, create tours for them with the online relocation services. We handle the rest - our mobile app – COMFORT360 - will automatically push these new tours/programs to your assignee by email. In a matter of seconds/minutes, you can send all the assignees details in your assignees smartphone. Why you should use our mobile app? There are no costs for download our mobile app, no setup fees and no subscription fees. You can send to your assignees up to 50 pushes every month and offer them access to all their rules/guidelines details right on their smartphones. If your assignees have installed COMFORT360 app, the tours/services that you add will be instantly updated in the app. COMFORT360 will serve your assignees as a mobile relocation assistant inside Egypt – catering for all their tours needs in one place. With COMFORT360, your assignee will have access to their tour/services details and will be able to manage programs. 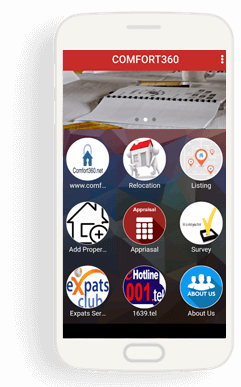 COMFORT360 offers a complete, hassle free way to enjoy all relocation & real estate services - real time notifications, online check-in, attractions at the destination, weather at destination - more precisely, COMFORT360 becomes a central hub for managing relocation & real estate services in Egypt. All you have to do is sign up for COMFORT360 Itinerary Management, start adding your assignees and create their tours/services in the platform. Your customers will receive automatically notifications with their tours details by email and get their relocation details directly to COMFORT360 mobile app. Follow your asignees in real-time! Have a look at the real-time map with an overview of your relocating assignees. You can see who is traveling, where and when is traveling at any given moment. Sign up for free, add your assignees in our platform, create their tours/services and offer them a valuableapp !